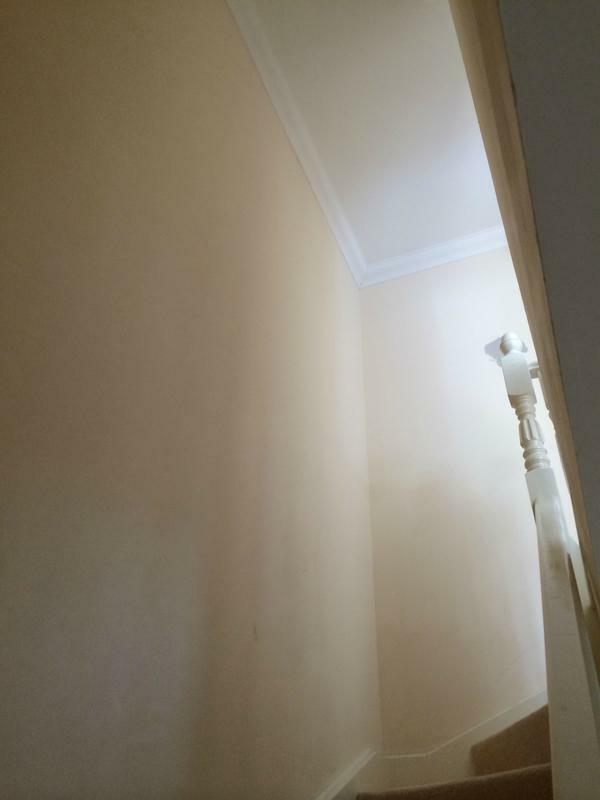 How do I safely paint the walls and ceiling in this high ceiling staircase? 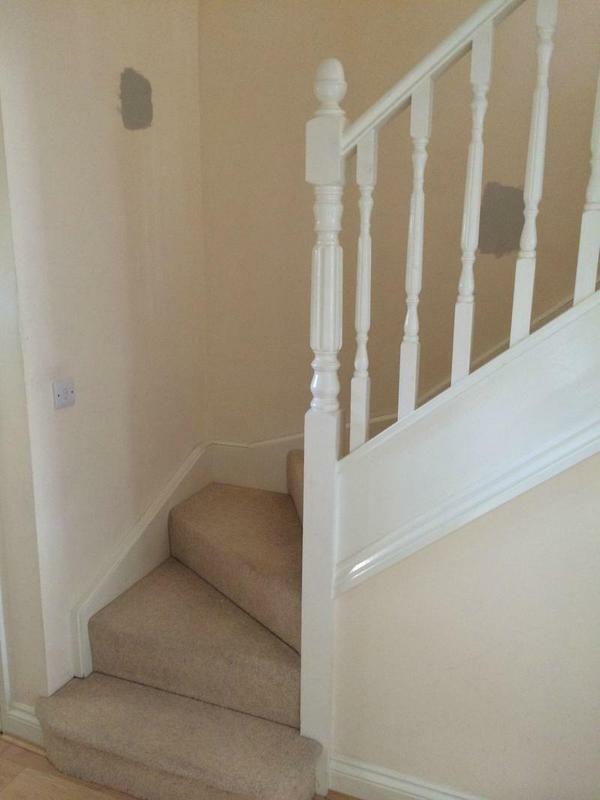 I need to paint the walls and ceiling in this staircase. The ceiling is flat, and does not slope down with the stairs. That means that the ceiling at the bottom of the stairs is very high. 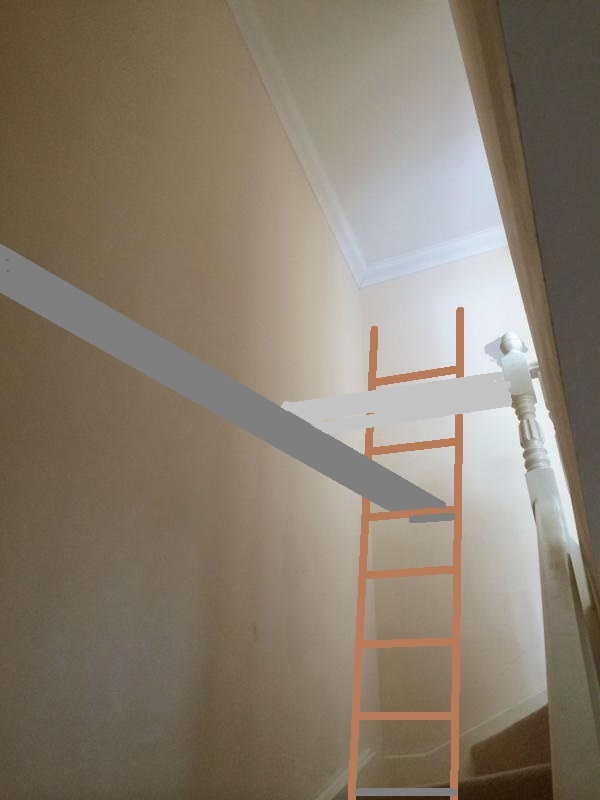 The walls and ceiling will be a different colour, so I need to be able to use a paintbrush to "cut in" under the coving. How do I safely paint this? I am in the UK (in case anyone wants to recommend a tool hire company). P.S. 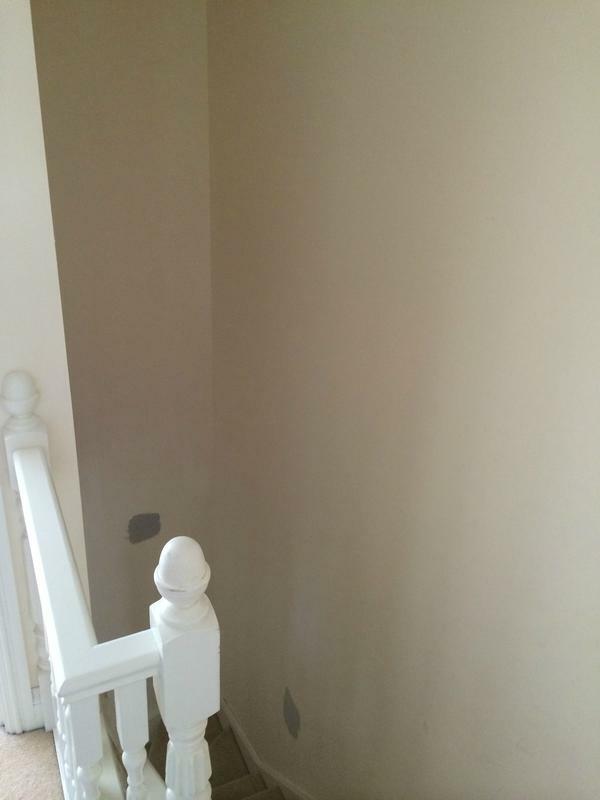 The test colours on the wall are not the colours I'm using. 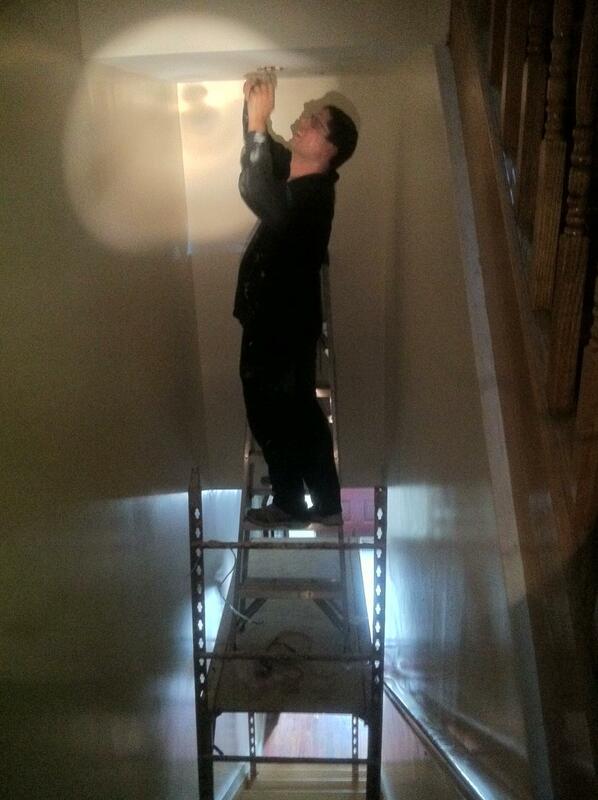 1) Lean a ladder against the lower wall, put boards connecting it with an upper stair, and put a ladder on top of that. If you are really careful, this might even look ok. 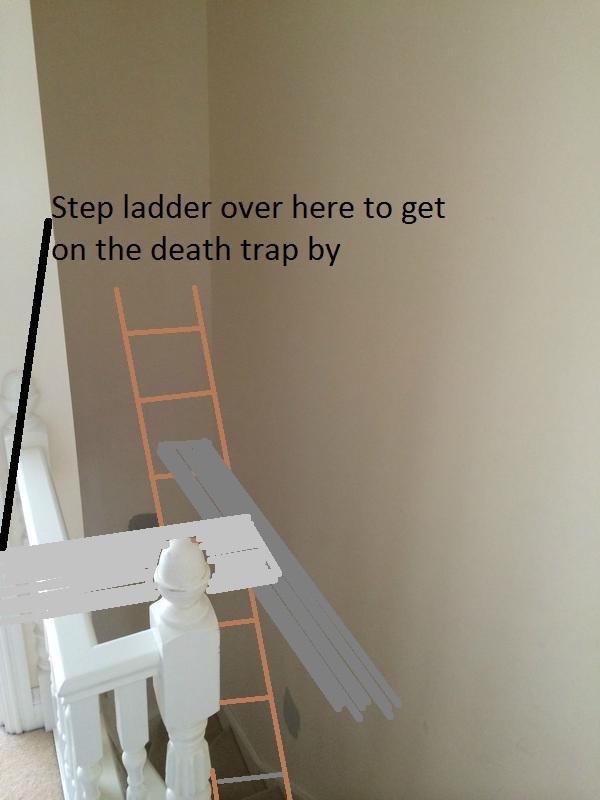 It may make some cringe, and it is not for the faint of heart, but I would use an extension ladder of the proper height, placed on the stairs so the angle is good for climbing, one of these for either end of the long run of the stair, and place a walk board, a 2X10 or 2X12 (in the US), that is the main work surface. Access to it would be by another item cobbled together a short step ladder and plank on the top level. I hate when people shill their products/services as answers to forum questions... But I'm going to do it anyway. We created it to address this need, which is why I feel OK posting it here. We read lots of painters' blogs and browsed lots of forums. There were a couple of really great DIY solutions that came up often (makeshift scaffolding with 2 ladders and a walkboard, and a custom-built ladder platform). 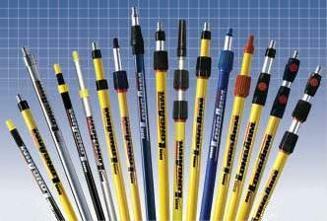 But we figured there was a need for an easy, adjustable product. I hope it helps someone out there. Not the answer you're looking for? Browse other questions tagged painting safety stairs or ask your own question. How to know what color of paint was used on the walls? Can I use a non-standard design for a stairwell ceiling cutout in an old house? How to safely put mirror tiles on the ceiling? How can I paint inside corners of textured walls at the ceiling or baseboard? Is it best practice to paint bath walls before before installing vanity, tile and sink?